The Nashoba Carriage Association was founded in 1997 in Germantown, Tennessee. 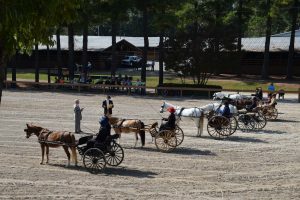 Early club activities included ‘introduction to driving’ clinics, and the first Nashoba Carriage Classic pleasure show was held in 1999 at Schilling Farms in Collierville, Tennessee. In 2003, the Nashoba Carriage Classic moved to the Germantown Charity Horse Show grounds, and the Arena Driving Trial was added to the show. The ADT is an exciting display of skill of both horse and driver as teams maneuver through hazards for the best time and the cleanest round. In 2016, we replaced the ADT at the show with the exciting Driving Derby, a popular competition in which drivers take on two sets of hazards at opposite ends of the arena. The Nashoba Carriage Association meets once a month in members’ homes for a potluck dinner, socializing, and a business meeting. Activities include clinics and pleasure drives on property of members and friends. Locations have included Saulsbury, LaGrange and Moscow in Tennessee, and Como, Holly Springs, and Sumner in Mississippi. A club outing to Sumner featured a drive around the square, through the cotton fields, and back to dinner in the formal gardens of the plantation home. Our annual Easter drive in Saulsbury includes an Easter egg hunt for the children and a wonderful lunch on the porch of a century-old log cabin. In the fall of 2014, Nashoba drivers put their ponies to harness in LaGrange for a Sunday drive around town, and afterward joined the parishioners of Immanuel Episcopal Church for a picnic on the lawn of the historic church. Competitions in the Southeast are popular for many of the Nashoba members. A contingent of the club has traveled to Pinehurst, North Carolina for the Classic in the Pines. Members also travel to Georgetown for the Kentucky Bluegrass Gala, the Carriage Association of America Carriage Festival, and The National Drive. Others take their horses to the Black Prong Equestrian Center in Florida for clinics and shows. A few of our members also have participated in Combined Driving Events (CDE’s) in Knoxville, Georgia and Illinois. CDE’s include timed cross-country events that encourage fitness and finesse. 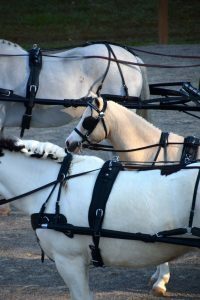 The Nashoba Carriage Association includes beginners as well as those with competition experience. We always are looking for people to motivate and educate us in the sport of driving. Nashoba’s members enjoy frequent clinics, pleasure drives and dinner meetings, where camaraderie and fellowship are hallmarks. In the spring of 2009, we held our first Fun Show, which included games as well as show classes to help participants learn the rules for combined driving events. Our members also have hosted ‘Learning to Drive’ clinics which are open to all skill levels. Past Nashoba clinics have featured many well-known carriage driving clinicians such as Larry Poulin, Wiebe Dragsta, Sterling Graburn, Bill and Sherri Lower, Bob Giles, and Tom O’Carroll. In recent years we have hosted Bill and Sherri for various clinics and fun shows. For many years, we hosted spring clinics with Tom O’Carroll and began a tradition of holding an Arena Driving Trial in conjunction with his clinic. In 2013 Robin Groves visited Nashoba for the first time, and we welcomed her back in September 2014. Sterling also visited Nashoba for a third time in the spring of 2014. 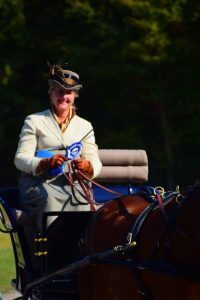 More recently, we have welcomed Elizabeth Keathley for a clinic leading up to our annual show, the Nashoba Carriage Classic. While some of our members participate in combined driving events across the nation, others simply enjoy local pleasure drives and shows. The Germantown Charity Horse Show, held each year in June, is a major event for the club. 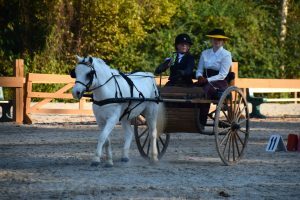 Drivers compete in the Opportunity Carriage Pleasure Driving division in classes such as Single Pony, Single Horse, Multiples, Carriage Dog, and Scurry Races. “The Charity” provides drivers with the chance to show to an enthusiastic crowd, and our speed classes and Carriage Dog are crowd favorites! You don’t have to have a horse and carriage to join the Nashoba Carriage Association! A simple love for horses, driving and fun is sufficient, and there are many ways to be involved and support the club activities even without a horse. We have many members who are observing and learning before they decide to take the plunge into horse, vehicle, harness, and trailer. Join us for a meeting or a clinic. But watch out…you will get the carriage driving bug! For more information, please see our ‘Events’ page, and if you have any questions, please contact us at the links below.